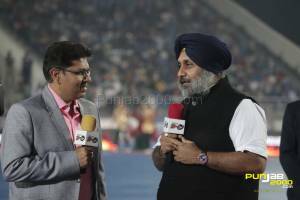 Mohali, November 22: United Singhs shocked the front runners, Khalsa Warriors when it mattered most in the closing minutes of the inaugural Wave World Kabaddi League final to crown themselves as the champions. The win also fetched them a prize of Rs. 1.80 crores and the glittering Trophy.The final played in front of a packed stadium on the International Hockey Stadium in Mohali, saw a tense and nail-biting finish.United Singhs, who had only 12 wins in the first phase as compared to 17 by Khalsa, trailed for three quarters of the match before pulling the run from under the feet of Khalsa Warriors and win 58-55. The scores were level at 53-53 before United inched ahead and kept their nose in front. In the third place play-off earlier, California Eagles beat Vancouver Lions 66-57. 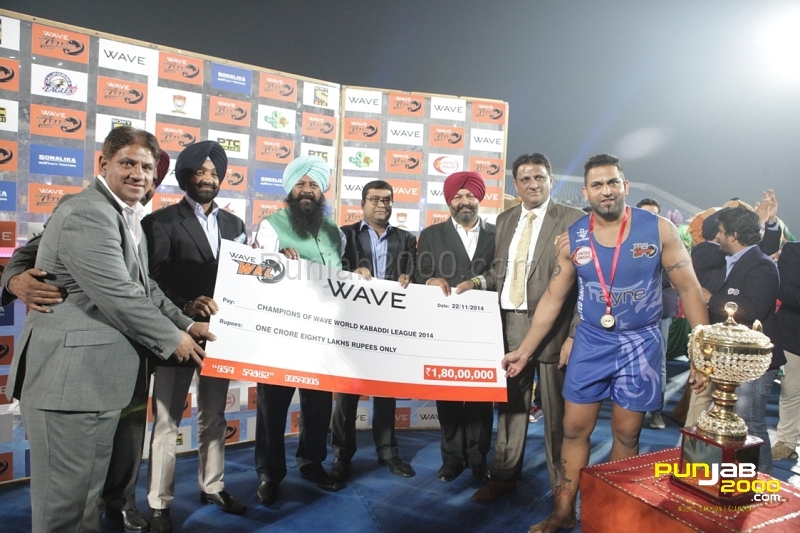 The runner-up Khalsa Warriors got a cheque of Rs. 90 lakhs while California Eagles got Rs. 45 lakhs and the fourth placed team Vancouver Lions received Rs. 21 lakhs. 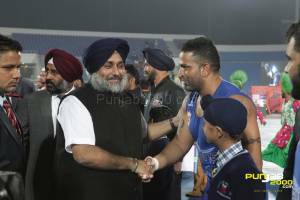 Mr. Sukhbir Singh Badal, the Deputy Chief Minister of Punjab and also the Chairman of the Wave WKL, came for the final and at through the match. 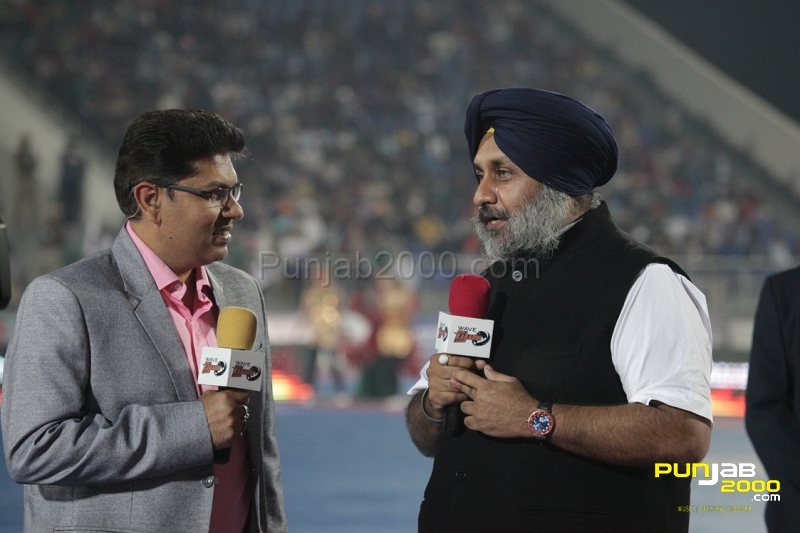 Mr. Badal said he was extremely happy that an Indian sport like Kabaddi was now global. He said he had encouraged the creation of the Wave WKL to give the sport more focus and to give its players a chance to play in a more organized way. He felt the sport was now ready to rival cricket in Punjab and more so in rural areas. He also referred to the World Cup that India has been hosting for the past four years and the next edition is due next month. He also assured the Wave WKL would be even bigger next year. Co-owner of United Singhs, film star Sonakshi Sinha, said she was thrilled at the success of her team. She added she was proud of the way her team had fought back despite their rivals taking a big lead at the start. “I am sure they will go all out to successfully defend the title next year,” she said. Khalsa, who opened a huge lead in the opening minutes at 7-1 kept the lead, though it kept decreasing from 18-11 in first session to 29-27 in second and then 43-42 after the third. AT the end of the match, it was United who were 58-55 ahead. 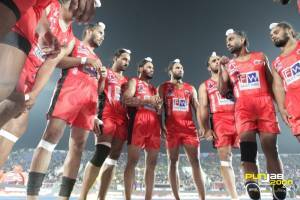 Before the final began, Amrinder Gill, the well-known Punjabi singer, who sang in the successful film, ‘Happy Go Lucky’ put the crowd in the right mood to enjoy the Grand Finale between the top two teams of the Wave WKL. As the final began, Khalsa were off to a great start as Gagandeep Singh Jogewal got off to a successful raid, followed by a fine stop by Gurpreet Singh and then Jasmanpreet Raju’s successful raid meant a 3-0 start for Khalsa Warriors. 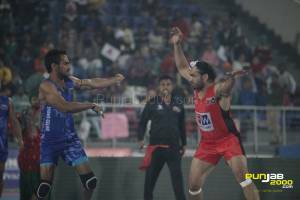 Khalsa were so dominant that barring one stop from United’s skipper Sandeep Singh Sandhu, who stopped Khalsa’s Yugraj Singh, they won seven of first eight points. Gagandeep’s fine raids as also those of Manjot Singh Gill meant Khalsa kept pulling away. 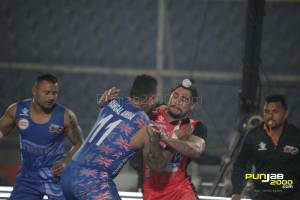 But United fought back gamely to narrow the gap to 11-15 mainly on the strength of their Stopper, Sandhu and raiders, Gagandeep Nagra, Navpreet Kumar and Lovepreet Sangha. Despite the fightback from United, Khalsa Warriors were ahead by a fair margin 18-11 at the end of the first quarter. In the second quarter, United continued their comeback on the back of their stoppers, Sandhu, Gurvinder Kahlon and Baljit Kooner as also raiders Navpreet Kumar and Lovepreet and one point they had reduced the lead to 19-21 and 20-22. Thereafter the lead stayed in the narrow range of two or three points. 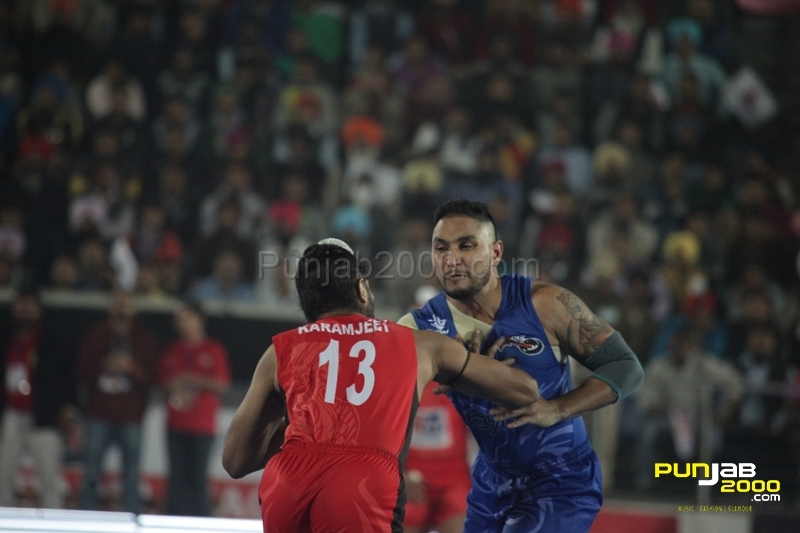 And, when the second quarter ended, the gap had been narrowed to two points as Khalsa led 29-27. Into the third quarter, the tussle became even tighter in the early stages as United came to 29-30, before Khalsa won two points, one from a stop by Gurpreet Singh and another from a raid by Jasmanpreet Raju. Again Khalsa pulled ahead 34-30, but United came back strongly to level at 36-36 with a successful raid by Navpreet and a stop by Sandhu. The see-saw battle continued as Lovepreet for United and Jasmanpreet for Khalsa won their raids and the trend continued till 38-38, before another successful raid by Lovepreet and a stop by Gurvinder Kahlon gave United Singhs a 40-38 lead for the first time. However Khalsa fought back once more to level at 40-40 and then as Lovepreet’s raiding streak was broken by Khalsa stopper, Jagdeesh Singh, Khalsa were back in lead at 41-40 and they stretched it to 43-41 before Lovepreet’s successful raid closed the third session score at 42-43 as Khalsa hung onto a slender edge. With the match hung in such fine balance, the two teams were neck and neck at 45-45 and then again 46-46. As Gurpreet Singh stopped Lovepreet once more and Khalsa’s Manjot Singh Gill made a successful raid, Khalsa were again ahead at 48-46 and then 49-47 with Navpreet for United and Jasmanpreet for Khalsa winning their next raids. However as the match entered the final moments, Khalsa once again made a fine bid Jasmanpreet again coming back with a good raid and Karamjit Lasarha making a good stop and after a raid from either side Khalsa again opened a handy lead at 52-48. 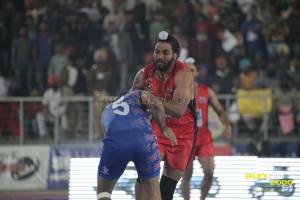 The fight continued as United won a raid each by Lovepreet and Navpreet and two stops by Gurvinder and Sandhu to level matters again at 52-52 and then 53-53. Successful raids by Navpreet and Lovepreet with a good stop in between by Gurvinder Kahlon turned the table at 55-52 in favour of United. 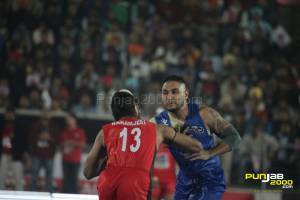 The lead stayed at three points for United at 57-54 and then after a successful raid by Gagandeep Jogewal for Khalsa, Lovepreet again came back victor from a raid to ensure final score of 58-55 for United Singhs. The crowd, which had begun rooting for the underdogs, United Singhs, who fought back from the early, went delirious as the hooter went off to crown United Singhs as the first Wave World Kabaddi champions. 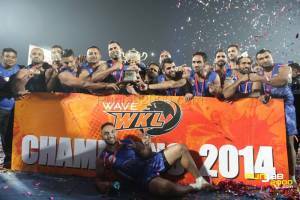 Wave WKL has eight teams, which will play every other team three times for a total of 21 matches per team in the League. 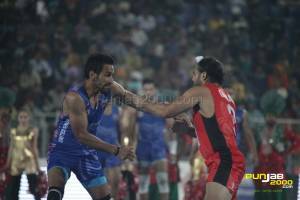 At the end of the League stage, the top four teams qualify for the semi-finals and the winners of the semis will play for the customised Wave World Kabaddi League Trophy and the cash prizes. The eight teams are: Khalsa Warriors, California Eagles, United Singhs, Punjab Thunder, Lahore Lions, Vancouver Lions, Yo Yo Tigers and Royal Kings USA. Wave WKL aims to become the go-to brand when it comes to sports entertainment. Wave WKL as a brand embodies strength, power, agility and entertainment. 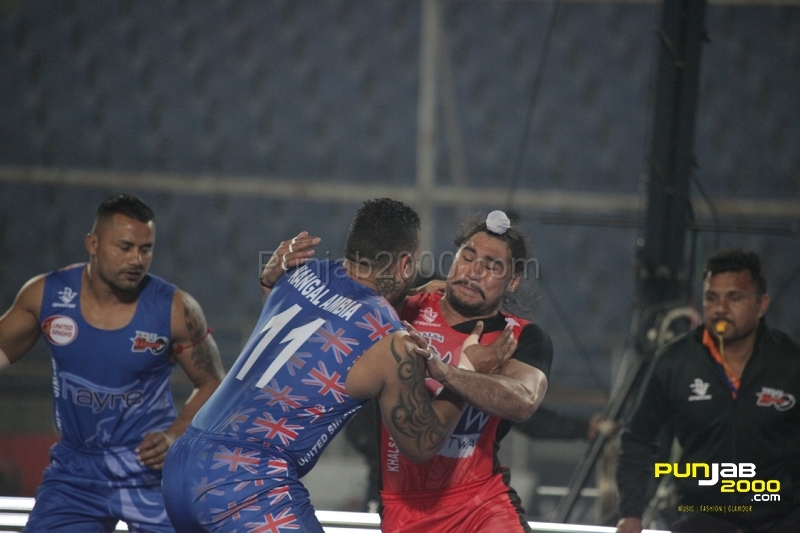 The Wave WKL seeks to take an indigenous sport to the world and redefining it for the Indian audience. 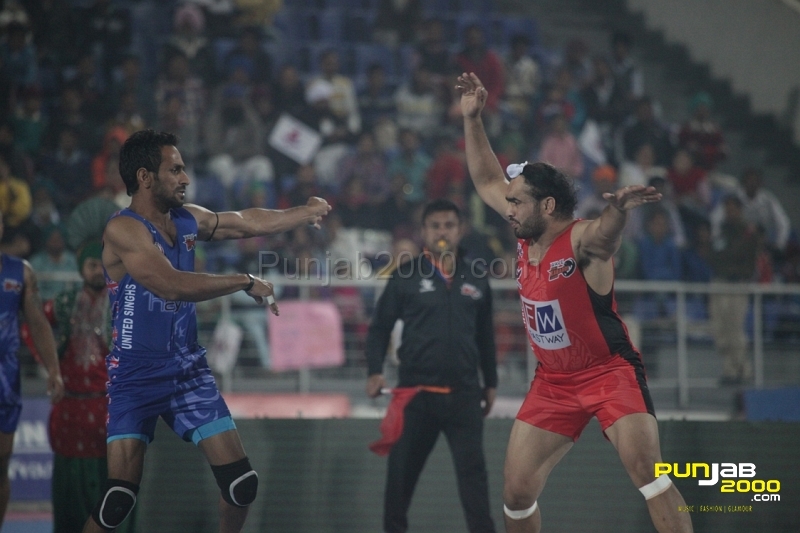 It gives Kabaddi a ‘gladiatorial’ persona and seeks to carve a niche for itself in a manner similar to the well-established sports like Football, Hockey, WWE and Cricket. Wave WKL brand visual identity, tone and texture are global and aspirational. The Commissioner of the Wave WKL is former India hockey captain, Pargat Singh, who has played for India at three Olympic Games and been the captain in two of them. The Chief Executive Officer (CEO) of the Wave WKL is Raman Raheja, a Sports and Entertainment Management professional with more than two decades of experience in Sport and Entertainment industries. The Wave WKL matches are broadcast live on Sony Six, the official broadcasting partner for the league in India. 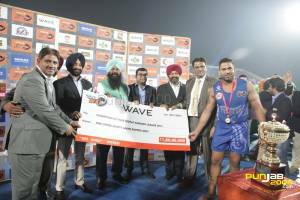 The Wave World Kabaddi League is a society registered with the registrar of firms & societies having its registered office at Chandigarh & Corporate office at Gurgaon. The aim of the organization is to build a dynamic and sustainable global sports league that grows World Kabaddi League as a Professional sport and engages fans and business associates with world class sports entertainment with better value, experience and service. The organization is committed towards driving mileage for a holistic ecosystem where fans transcend nationalities and actively participate amongst themselves, their teams and the league partners, thus becoming a truly global audience. The society respects the rich tradition of Kabaddi and would simultaneously focus on making the sport contemporary. The Wave WKL will take the sport to state of the art venues and provide the spectators and followers with better entertainment in a clean, secure and comfortable environment.